Picked up my wedding gown yesterday! Eeeeekkk--it was quite an exciting experience, as I'd been anticipating this moment for over a month. Yay! We chose our photographer a few weeks ago. His name is James, and he is also my friend's friend. This makes the whole process much easier and enjoyable because I know that Greg and I will be comfortable with him. He also has a super cool and easy going personality. That's a big plus!! When you choose your photographer, make sure that you and him/her can feel at ease with each other. Many wedding magazines claim that if there is an awkward mood between both parties, then that same awkwardness will show in the pictures. I mean, I can't imagine giving a forced smile that would probably look more like a smirk, haha! We are seeing if we have any significant friend-connections to professional DJ's. I have been looking for some who have good reviews, but we are still in the process of searching for "the one". I can't choose which cake shop I want to visit! As you may have noticed, I am a complete weakling when it comes to cake...Think, get weak in the knees type of infatuation. :P Oh gosh, I sound obsessed. *ahem* So, I am thinking that visiting about 4 cake vendors would be wise. What do you think? :D Perhaps that's too many, but I want to feed our guests the best cake out there, and I would only want to feed them something that I myself would enjoy. If you are curious about the wedding preparation summary, then you can go ahead and click on the first link of this post. Today, Greg and I will be going tux and suit shopping!!! :D It would be so awesome to have his groomsmen with us, but they all live far away. Due to the whole distance factor, we are thinking that trying out chain stores like Men's Wearhouse would be the best way to go. This way, they can easily get their suits fitted in their own local area. I also didn't forget about the amazing pasta sauce recipe I promised! I'm really not trying to too my own horn here guys, but I think this is one of the best tomato pasta sauces I've ever made. I think that cooking the sauce for long hours really makes this sauce ultra tasty and full of complex flavors. 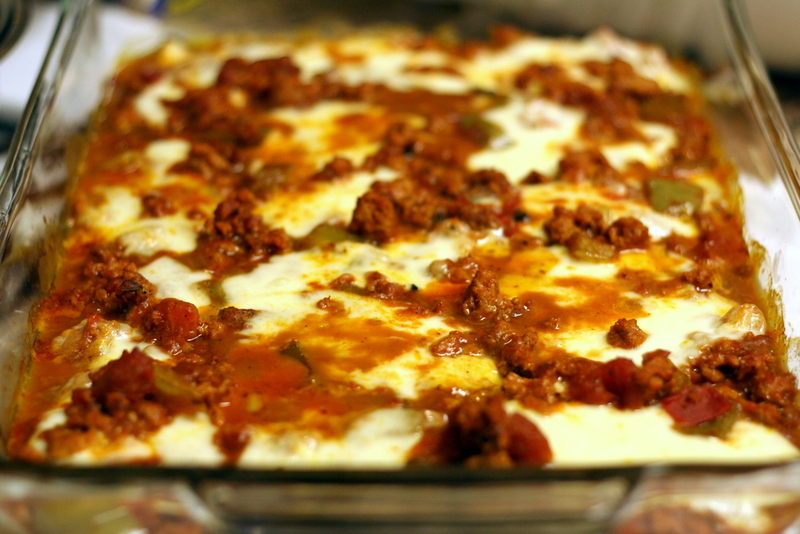 I made an eggplant bake dish with the sauce, and while it is a hearty and satisfying meal, it is also very "clean" and contains a good portion of carbs, protein, and fats. Heat a skillet or small pot on medium-high heat. Add the olive oil from the first ingredient list. Add the onion and bell pepper first into the pot. When the onions have become a bit translucent, add the diced tomatoes and ground turkey. Begin to break up the turkey with a wooden spatula. Let it cook for about 4-5 minutes, or until the meat is slightly browned. Stir occasionally. Then, add the garlic, vinegar, and salt+pepper. Cook for additional 3 minutes. Turn off heat and move on to the next step. Get your crock pot or slow cooker, and pour in all of the ingredients from the second ingredient list, except for the eggplant. Stir it well so that everything is incorporated. Set the crock pot to a duration of 6 hours, and you can just go ahead and let it cook on its own! ***Optional step*** Preheat your oven to 400 F. Place the sliced eggplants evenly on a lightly greased baking pan. Then, when the sauce is finished cooking, pour it on top of the eggplant. If you so desire, you can add fresh mozzarella cheese on top of the mixture. Bake for approximately 16-18 minutes. Once again. I think that the key to delicious marinara or meat sauce is the long hours of cooking in the pot. I hope you have a blessed, warm, and glorious day!